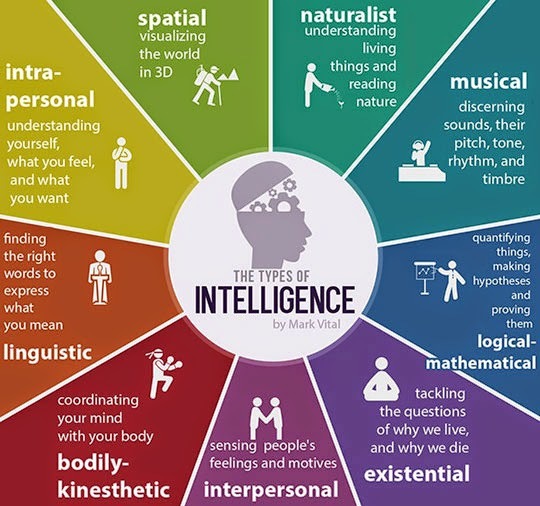 This graphic should probably be named something less definitive than The Types Of Intelligence since there are others. I wouldn't get carried away throwing just any skill or ability up here, though. Consider writing. Writing can fall under "linguistic intelligence" but most writers are terrible at expressing their thoughts fluidly. This deficiency is why they write-- for the reward of seeing their thoughts expressed. Writers bang their head against a desk doing what people with a high linguistic intelligence do easily. Its like a person drawn to the forest; not because they are a naturalist, but because they feel disconnected from nature.